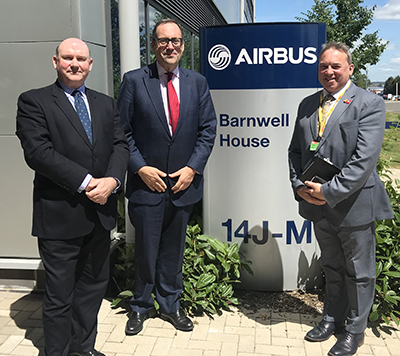 Business and Industry Minister Richard Harrington, was in the West of England today to meet Regional Mayor, Tim Bowles, and visit two of the region’s biggest aerospace companies. 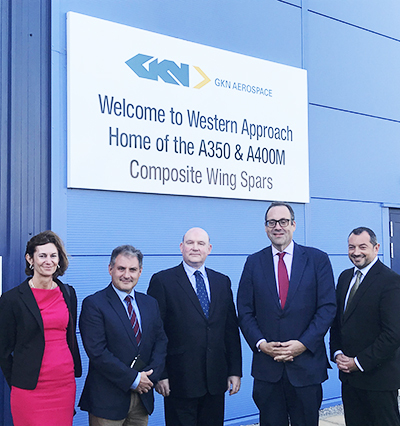 Along with the Mayor, he toured the Airbus landing gear facility in Filton and the GKN Aerospace Western Approach composite wing structures manufacturing and assembly facility. They also took part in a round table discussion with business leaders, including the Chairman of the Local Enterprise Partnership, Prof Steve West. Business and Industry Minister Richard Harrington said: “The UK is a world leader in aerospace and the West of England is central to this as a flourishing hub for innovation, growth and talent. Regional Mayor, Tim Bowles, said: “The West of England is home to the UK’s largest aerospace cluster, boasting 14 of the world’s top aerospace companies. However, there is a skills shortage so it’s important that we continue to work with government, with industry and our universities to tackle that, to ensure we continue to lead in this field. Katherine Bennett, Airbus Senior Vice-President, Public Affairs, said: “The West of England is a heartland of Britain’s economically important aerospace industry and we are proud to continue that fine tradition at our site in Filton. The name has long been associated with aviation innovation and today we employ one of the largest numbers of engineers under one roof, focusing on wing technology. The GKN Aerospace Western Approach facility is a key part of the company’s global business and is an international Centre of Excellence in composite wing structure design and production. Russ Dunn, GKN Aerospace Senior Vice-President Engineering and Technology, said: “GKN Aerospace Bristol facilities are world-leading: supplying today’s largest aircraft manufacturers and developing technologies for the aircraft of the future.